There’s been crashes, disqualifications and Froome hitting the front – and at Stage 5 the race has barely started! 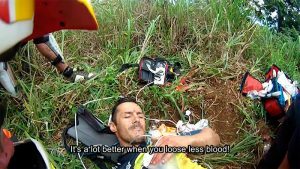 The 2017 Tour de France, one of the world’s great sports events is in full swing and this year the Fire and Ambulance crews attending the Tour are prepared for emergencies with Celox Rapid Gauze. The fastest acting haemostatic gauze, Celox Rapid was a product originally developed for the battlefield to treat injured soldiers and is now carried by many civilian emergency services to treat life-threatening bleeding injuries. Celox Rapid can stop life-threatening arterial bleeding with only 60 seconds compression. Moreover Celox is the haemostatic gauze of choice of the UK Ministry of Defence and is carried by soldiers and medical providers around the globe. 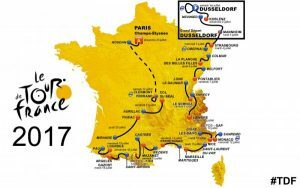 The Tour de France is the world’s greatest cycling event where elite cyclists can reach speeds in excess of 50 Kph. Cyclists are vulnerable at these speeds in crashes and at particular risk when accidents occur in and around the peloton. 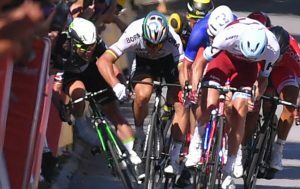 The competitors are often run over by fellow cyclists with no room for manoeuvring, exactly what happened to British cyclist Mark Cavendish this week who suffered a broken shoulder after crashing into the barriers following an elbow to the face by another competitor. Broken bones are not uncommon sight at the Tour. It has also seen injuries involving barbed wire fences, motor vehicles and impacts with stationary road blocks over the years. Life-threatening injuries have been known to happen as cyclists are caught by handle bars in the groin when losing control, puncturing the main artery in the thigh, the Femoral artery. A femoral artery bleed if not controlled quickly can lead to death in 3-4 minutes. During the Tour de France, crowds of fans line the roads in their thousands every day for the four weeks of the race. They are spread over hundreds of kilometres on each stage, creating a unique challenge for the security services. The emergency services are determined to keep the public safe against any possible attempt at a terrorist attack or attempt to disrupt the event and by carrying 4BC kits and Celox Rapid they are better prepared at this year’s Tour for a range of eventualities. We hope nothing goes wrong – the professionals make sure of it.